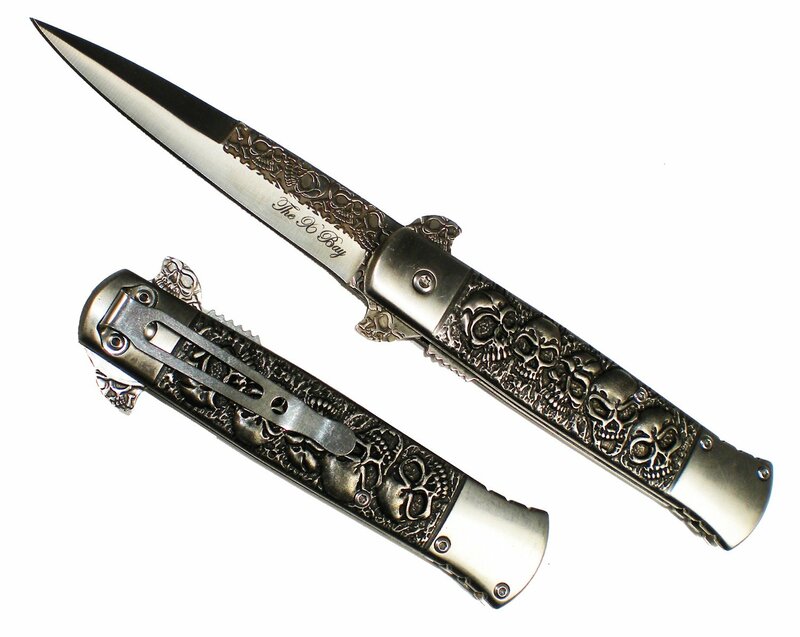 Switchblades are popular for its convenience and small size making it easily portable. These knives are quite handy and can be used for various purposes. They are folding or sliding knives that are contained in the handles and can be carried by the better sliding into a pocket. They are high performing with sharp blade making it extremely convenient during outdoor adventures. The guide will help you make the right selection and purchase the best switchblade from a wide range of variety available in the market. It is a challenging task to find the best and most efficient product but the products listed below are tested and tried by experts, making them a great buy. Opening Mechanism – It is one of the most important things to check for as it decides if the knife is of high utility or not and handy. The assisted spring opening mechanism is easy and convenient which helps in opening of the knife with one hand. Make sure that the knife folds and unfolds automatically with help of button click, unlike a traditional knife. Blade Performance – The blade is important because it is what is going to take care of everything tactical. Stainless steel blade construction is best as it prevents rust and corrosion making it a long term an asset. Serrated blades are great for cutting ropes, plants etc. while smooth blades can be used for wide range of activities. Blade length and knife size – The length of the blade is an important aspect which cannot be ignored. It should be well designed and secured within the handle. The construction must be tough and sturdy with the size of the knife not too long. The more compact the knife is, the better is its portability characteristics. 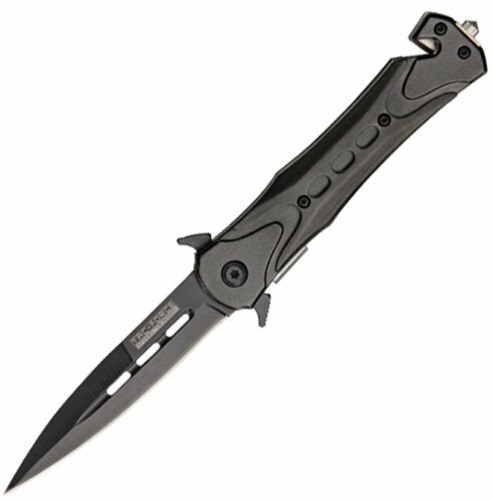 Emergency features – It is always better to purchase a tactical pocket switchblade which has certain emergency attributes. Features like a bottle opener, belt cutter, glass breaker etc. add to the diverse utility of the knife. If a knife has all these features included it is better and more effective. 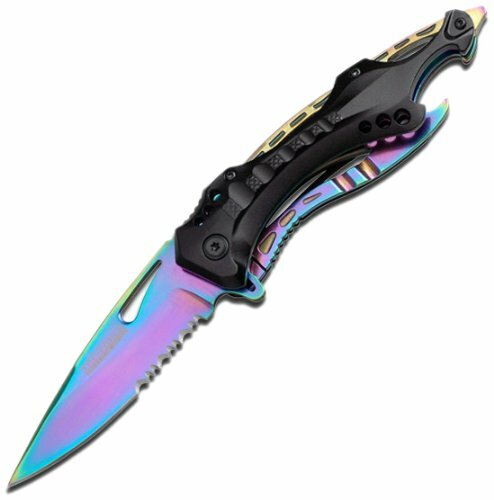 The switchblade from TAC Force enabled one hand deployment and has a 3mm thick half serrated blade of 3 ¼ inch made from stainless steel. It is small in size that can be slid into the pocket and is a great asset during outdoor adventures. The knife comes with liner lock that securely places the spring assisted opening folding steadily in place. The blade of the knife is contained in a sturdy aluminum handle which also features a bottle opener along with glass breaker. The tactical knife is a must buy for its portable size and its ability to assist with versatile emergencies. The half serrated blade is perfect for cutting ropes, tree branches, prevent predator attack etc. It consists of a pocket clip on the back of the handle to cling the knife safety to pocket. Half serrated stainless steel blade can be used for cutting ropes, bushes etc. The pocket size tactical knife is not only useful for wide range of activities but flaunts its gothic and aesthetic outlook through its skull design embedded on handle and blade. The stylish knife is available in different colors according to an individual’s personality. The overall length of the knife when opened is 9 inches and is constructed from steel. The liner locking mechanism of the knife ensures it is secured efficiently and can be folded back to the handle and extended with one hand. The Michael Corleone Godfather style Italian Inspired Knife is the perfect pocket knife with a belt clip on the back side to fasten it strongly to the belt. The easy to use and handy dagger style knife is all you need to accompany you on your adventures. It is constructed strongly with a 3 ½ inch blade made from stainless steel that is accompanied with assisted opening. The knife boasts of curved extended tangs, blood groove with the blade flaunting the false top edge. The blade neatly seats into the aluminum handle with a slot cut out design. The knife also has an integrated seat belt cutter for emergency use along with a glass cutter. It is small and sturdy with the length of the only 4.5 inch when closed and has a proper locking mechanism for securing the blade in the handle. The blade tends to become dull after a while and needs sharpening. The switchblades are pocket sized folding knives which are great for wide range of activities and best for tactical purpose. Right from cutting bushes, rope, plants etc., it can be used for many outdoor works. They are small, sturdy and portable owing to their compact size that can be clipped onto the pocket. With mostly the spring assisted system and efficient locking mechanism, it can be opened with one click and locked in the secure manner. The blade can be deployed using one hand. With so many options in the market, choosing the best switchblade becomes a challenging task which is why this comprehensive guide will be helpful. After personal test and trail, review with pros and cons are written by experts in helping you make the right selection. Pardon the pun, but isn’t the purpose of a largish easily opened easily accessible ‘pocket’ knife to cut your way out of an emergency. I once was going to get mugged for my iPad and having bad hips was not getting away. Things did go my way and I avoided using my knife. It was a very close call. Many of these knives are not of a legal length. You could go to jail. I am taking my chances in this respect and I know it. I thought about a fixed blade knife. I also thought about a small handgun. Then I thought about moving away from this somewhat dangerous neighborhood. I am pretty old and I think moving is the best idea. As an older person who is also white, I do have an advantage. People don’t think of some older white man with graying hair as having a concealed weapon. Wear tidy, clean clothes and get a good haircut. Keep a good shave and trim your mustache. TRY TO STEER CLEAR OF TROUBLE. Remember that there are cameras almost everywhere and doors often have a magnetic alarm. You can’t just take the knife everywhere. I know this isn’t a very upbeat letter, but I speak the truth as I see it and tell you what happened to me. Get a short knife that really is a pocket knife. Sharp as a razor and never use it for anything that might dull it. Treat it like a weapon. Because it is SMALL you will have some deniability. Give serious consideration to moving. Maybe just go a better neighborhood. Look at the increased rent as insurance. Keep your eyes open and use escape as your first option. RUN if you have to. PS Sometimes life really depresses me. I have never really hurt anyone.